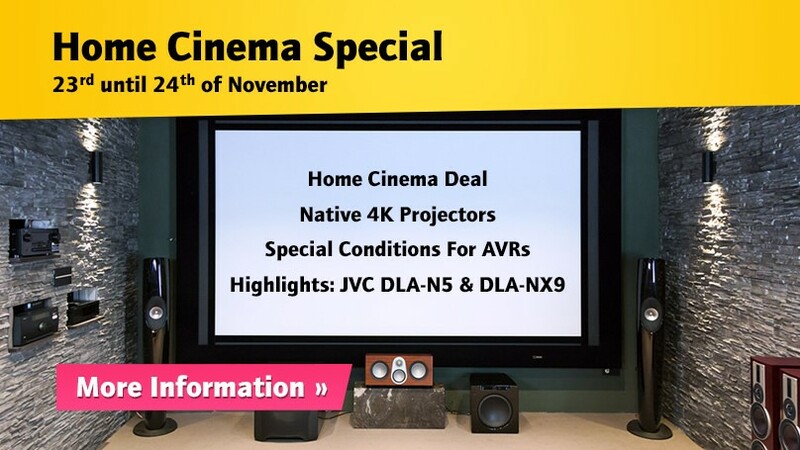 What could be nicer than sitting comfortably in your own home cinema at cool temperatures, surrounded by a projector, fancy speakers and other home cinema electronics, and letting the bad weather pass by? Since we now have four studios where you can get your own idea of the dream of home cinema, we are inviting you to our studios on November 23rd and 24th. On top of that, we are combining this with a sales campaign. Further information can be found below. We are looking forward to two turbulent action days, during which we will focus on our four home cinema studios in addition to our normal daily business. We invite you to experience our renovated rooms in action and to bring along all questions about home cinema. All our high-quality projectors and AV receivers will be available for a demonstration so that you can take your time to look at the new models. In addition, you have the opportunity to trade in your old equipment and equip yourself with new technology. We are especially looking forward to Peter Hess from JVC Deutschland, who will present the two new top models JVC DLA-N5 and JVC DLA-NX9B. In addition, you have the opportunity to trade in your old equipment and equip yourself with new technology. (This refers to current devices, not to already discounted models). When purchasing AV receivers and projectors from the current series, we thank you with a premium of up to 1,000 euros depending on the model.